In 2010, Charlie was assigned the task of helping with the blog for our Cape Cod Bed and Breakfast. Although he was a bit hesitant about this undertaking at first, he set about the task of finding something relative to write about. Since he loves wine and we serve complimentary wine to our guests in the afternoons, he decided that would be the perfect topic for him to blog about. Throughout last year, Charlie thoroughly enjoyed the research he had to do to prepare for the task of writing a wine blog each week and in selecting wonderful and interesting wines to introduce to guests at our Sandwich B&B. 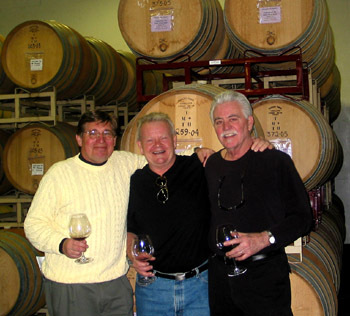 He was a regular attendee at the weekly wine tastings at the Belfry Bistro and always made time to be on hand at his favorite wine purveyors in Sandwich, Cellar 55 Wine Merchants, anytime there was a tasting. When he received an invitation to wine tastings elsewhere, he readily accepted. The result was a weekly contribution to our Inn blog and some amazing wines to serve to our guests. Charlie has so enjoyed his weekly wine blogging – Charlie’s Weekly Wine-ings – that we have decided to give him his own wine blog. It is called Cape Cod Wine Time and can be found at wine.innatsandwich.com. As we prepare for the 2011 summer season and as formal wine tastings are underway on Cape Cod, Charlie will be blogging regularly about wonderful wine’s he has found to serve our guests. Now he can write to his heart’s content about his favorite subject. We hope to welcome you to our Sandwich Bed and Breakfast this season and promise to introduce you to some great wines.